Subclavian artery thrombosis is a condition in which the blood flow through the vessel is obstructed. The occlusion typically arises secondary to damage to the intima of the artery. This damage can occur as a result of external muscular compression and repetitive stress to the artery or because of atherosclerotic changes to the vessel. Embolic phenomena and hypercoagulable states are also contributing factors. Symptoms occur secondary to lack of blood flow to the affected extremity. To maintain blood supply to the extremity, blood is naturally rerouted from the vertebral, carotid, and internal mammary arteries, producing the various steal syndromes. Subclavian artery thrombosis is common in young athletic individuals who exert a significant amount of upper body activity. Sudden occlusion from emboli followed by thrombosis of the artery is common in the population with signs of significant atherosclerotic disease. The patient presenting with acute subclavian artery occlusion usually has a history of repetitive use of or stress injury to the upper extremity on the affected side. A history of upper-extremity claudication is common. In situations where the occlusion is secondary to atherosclerosis, acute thromboses of the artery are generally asymptomatic. In fact, in 9% of autopsy series, the left subclavian artery was either stenotic or occluded. If symptoms are present, upper-extremity claudication on the affected side is most common. The patient may also present with dizziness, vertigo, imbalance, visual disturbances, or hemisensory dysfunction indicative of a subclavian steal syndrome. However, note that subclavian steal is observed on 2% of cerebral angiograms and causes no symptoms. The anatomy of the subclavian artery in the thoracic outlet. Aberrant origins of the subclavian artery off the aortic arch can be a cause of subclavian artery occlusion. In atherosclerotic disease, the carotid-subclavian and carotid-vertebral junctions are areas that appear to be predisposed to atheromata formation and calcification. Subsequently, this region is most likely to be involved in the occlusive process. Areas of the subclavian artery that are exposed to repeated forms of injury resulting in intimal damage are predisposed to occlusion. The affected artery demonstrates detectable intimal damage, which is usually secondary to compressive forces exerted by the muscles of the shoulder girdle that compress the artery. Bony abnormalities in this area can also contribute to the process. As these muscles enlarge secondary to physical activity, they exert pressure on the artery. This pressure, coupled with exertional activity of the upper extremity, can stretch and compress the intima, thereby disrupting its natural integrity. This disruption precipitates platelet deposition in the area, with resulting thrombosis. Atherosclerotic changes in the vessel occur secondary to the flow characteristics in the area. These depositions are accelerated by all of the dietary and sociologic influences that affect the progression of atherosclerotic disease, including smoking, hypercholesterolemia, and hypertension. Occlusion secondary to atherosclerosis is more insidious and often causes no symptoms. At times, the symptom complex of claudication precedes the actual loss of blood flow. Patients with hypercoagulable states, either intrinsic or secondary to dehydration complicated by concomitant cardiac arrhythmias and systemic inflammatory processes, make up a small subset of individuals who may exhibit this pathology. The occlusion arises secondary to damage to the intima of the artery. This damage can occur as a result of external muscular compression and repetitive stress to the artery, atherosclerotic changes to the vessel, or inflammatory processes. Embolic or thrombotic occlusion of the artery occurs, particularly in the presence of atherosclerotic stenoses. Hypercoagulable states contribute to this scenario. Symptomatic lesions occur in less than 1% of the population. In autopsy series, 9% of the population demonstrate stenosis or occlusion of one subclavian artery, usually on the left. About 2% of cerebral angiograms demonstrate asymptomatic subclavian steal. Outcomes from operative treatment of subclavian artery thrombosis have demonstrated a patency rate of approximately 90% after 5 years. The prognosis for the patient with atherosclerotic disease is directly dependent on the severity of the disease and on the willingness of the patient to make lifestyle modifications, including cessation of tobacco use and regulation of diet. If these modifications are made, the progression of the atherosclerotic process slows, and the risk of recurrence of thrombosis falls. For the patient whose occlusion is secondary to thoracic outlet problems, the prognosis after therapy is excellent. Nuber GW, McCarthy WJ, Yao JS, Schafer MF, Suker JR. Arterial abnormalities of the shoulder in athletes. Am J Sports Med. 1990 Sep-Oct. 18(5):514-9. [Medline]. Muzaffar M, Fatimi SH, Tariq M, Hanif HM. Subclavian steal syndrome secondary to subclavian artery thrombosis in a patient with homocysteinemia and its successful treatment. J Pak Med Assoc. 2012 Oct. 62(10):1118-20. [Medline]. Mandalam KR, Rao VR, Gupta AK, Joseph S, Unni NM, Rao AS. Occlusion of an aberrant right subclavian artery arising from a Kommerel diverticulum. J Vasc Interv Radiol. 1993 Jul-Aug. 4(4):577-9. [Medline]. Zimmerman NB. Occlusive vascular disorders of the upper extremity. Hand Clin. 1993 Feb. 9(1):139-50. [Medline]. Nehler MR, Taylor LM Jr, Moneta GL, Porter JM. Upper extremity ischemia from subclavian artery aneurysm caused by bony abnormalities of the thoracic outlet. Arch Surg. 1997 May. 132(5):527-32. [Medline]. Karpenko A, Starodubtsev V, Ignatenko P, Gostev A. Endovascular Treatment of the Subclavian Artery Steno-Occlusive Disease. J Stroke Cerebrovasc Dis. 2017 Jan. 26 (1):87-93. [Medline]. Jones CS, Verde F, Johnson PT, Fishman EK. Nontraumatic Subclavian Artery Abnormalities: Spectrum of MDCT Findings. AJR Am J Roentgenol. 2016 Aug. 207 (2):434-41. [Medline]. [Full Text]. Laitt RD, Thompson JF, Goddard P, Wakeley CJ, Murphy P, Lamont P. Subclavian artery aneurysm: the role of magnetic resonance imaging. Cardiovasc Surg. 1994 Oct. 2(5):612-4. [Medline]. Cohen JE, Rajz G, Gomori JM, Verstandig A, Berlatzky Y, Anner H, et al. Urgent endovascular stent-graft placement for traumatic penetrating subclavian artery injuries. J Neurol Sci. 2008 Sep 15. 272(1-2):151-7. [Medline]. Shalhub S, Starnes BW, Hatsukami TS, Karmy-Jones R, Tran NT. Repair of blunt thoracic outlet arterial injuries: an evolution from open to endovascular approach. J Trauma. 2011 Nov. 71(5):E114-21. [Medline]. Varcoe R, Smith W. Use of a cutting balloon and a paclitaxel-coated balloon to treat recurrent subclavian in-stent restenosis causing coronary subclavian steal syndrome. Cardiovasc Revasc Med. 2011 Nov-Dec. 12 (6):403-6. [Medline]. Miyakoshi A, Hatano T, Tsukahara T, Murakami M, Arai D, Yamaguchi S. Percutaneous transluminal angioplasty for atherosclerotic stenosis of the subclavian or innominate artery: angiographic and clinical outcomes in 36 patients. Neurosurg Rev. 2012 Jan. 35 (1):121-5; discussion 125-6. [Medline]. Rogers JH, Calhoun RF 2nd. Diagnosis and management of subclavian artery stenosis prior to coronary artery bypass grafting in the current era. J Card Surg. 2007 Jan-Feb. 22(1):20-5. [Medline]. Dave B, Bhatt N, Gupta M, Khalasi Y, Balasubramanya KS. Subclavian artery thrombosis--management with thrombolysis and angioplasty. J Indian Med Assoc. 2004 Sep. 102(9):519-20, 527. [Medline]. Burihan E, Soma F, Iared W. Angioplasty versus stenting for subclavian artery stenosis. Cochrane Database Syst Rev. 2011 Oct 5. CD008461. [Medline]. Bradaric C, Kuhs K, Groha P, Dommasch M, Langwieser N, Haller B, et al. Endovascular therapy for steno-occlusive subclavian and innominate artery disease. Circ J. 2015. 79 (3):537-43. [Medline]. Soga Y, Tomoi Y, Fujihara M, Okazaki S, Yamauchi Y, Shintani Y, et al. Perioperative and Long-term Outcomes of Endovascular Treatment for Subclavian Artery Disease From a Large Multicenter Registry. J Endovasc Ther. 2015 Aug. 22 (4):626-33. [Medline]. Chang KZ, Likes K, Davis K, Demos J, Freischlag JA. The significance of cervical ribs in thoracic outlet syndrome. J Vasc Surg. 2013 Mar. 57(3):771-5. [Medline]. Santra G, Banerjee S, De D, Bhattacharya K. Right subclavian artery thrombosis due to cervical rib. J Assoc Physicians India. 2012 Sep. 60:51. [Medline]. Thompson RW. Challenges in the treatment of thoracic outlet syndrome. Tex Heart Inst J. 2012. 39(6):842-3. [Medline]. [Full Text]. Thompson JF, Webster JH. First rib resection for vascular complications of thoracic outlet syndrome. Br J Surg. 1990 May. 77(5):555-7. [Medline]. Carotid-subclavian bypass for subclavian steal syndrome. 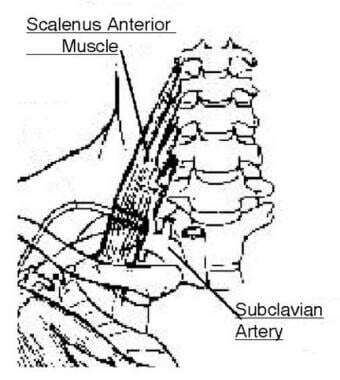 Subclavian-subclavian or axillary-axillary bypass for subclavian artery occlusion. Alcohol and the Electric Atrium: How Drinking Promotes AF?